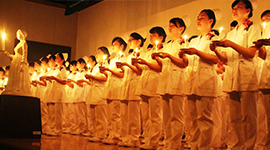 Okayama Medical Welfare School is one of the few medical colleges in Japan that has both a Department of Nursing and a Department of Elderly Care. Amid Japan’s rapidly aging population, the provision of healthcare support, where nurses and care workers work together as a team, is increasing in demand. At our school, young nurses and care workers in the making are learning and working together, always smiling and facing challenges with a positive attitude like Anne Shirley, the main character of the well-known novel, Anne of Green Gables. Kindness. Consideration. Empathy. These are the essential attributes for healthcare professionals. 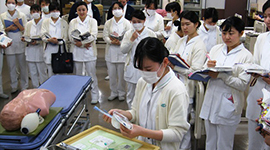 Okayama Medical Welfare School guides young nurses and care workers to develop their skills and key qualities under the college philosophy of ‘education that resonates with heart’.